The autopsy of a recently-recovered crocodile carcass in Odisha’s Bhitarkanika National Park (BNP) has revealed that it died due to asphyxiation after being entangled in a large fishing net. 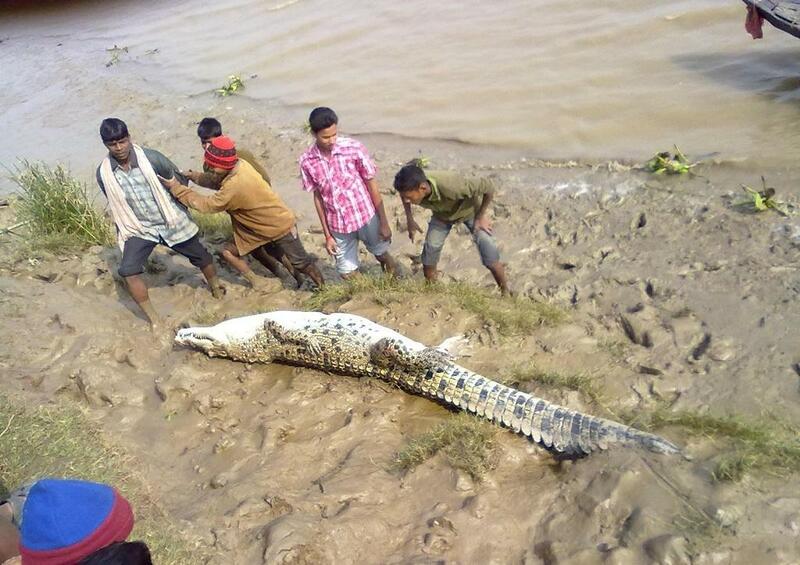 The carcass of the 10-feet-long animal was found on March 21, 2019, in the Bramahani river near Nalitapatia village within the BNP, in Kendrapara district. "The forest officials retrieved the floating body from the water and sent it for autopsy to the veterinary office at Rajnagar. The autopsy report on March 27 revealed that the crocodile died due to asphyxiation after being entangled in a large fishing net,” said Bimal Prasan Acharya the divisional forest officer of the park. The March 21 find is the 25th incident of unnatural crocodile death in BNP in a span of seven years, which has baffled forest officials and environmentalists. It is illegal on the part of the locals to kill a saltwater crocodile as the species is covered under Schedule I of the Wild Life (Protection) Act, 1972, added Acharya. The rivers, creeks and other water bodies within Bhitarakanika are the home of around 1,700 endangered saltwater crocodiles. Fishing is banned in Bhitarkanika’s waterbodies. But some locals illegally fish in them and the illegal fishing is taking a toll on the saltwater crocodiles. As illegal fishing continues unabated and offenders go scot-free, more and more crocodile carcasses wash ashore entangled in fishing nets, said, Hemant Rout, an environmentalist and the secretary of Gahiramatha Marine Turtles and Mangrove Conservation Society (GMTMCS). Three years ago, a fisherman was arrested on the charges of killing an endangered saltwater crocodile in Babar creek under Mahakalapada block near the park. Six years ago, forest officials had arrested two poachers at Talachua village within the park on charges of killing a saltwater crocodile. A crocodile hide was also seized from them. Locals and poachers also kill the reptiles by poisoning dead cattle and keeping the carcasses near the river bank, added Rout. The mortality rate of baby crocodiles in the wild is high as out of 500 hatchings, only one survives to become an adult after reaching 15 years. So, the unnatural death of 25 adult crocodiles within seven years in Bhitarkanika is alarming. Illegal fishing is taking the lives of crocodiles in Bhitarkanika, said Sudhakar Kar, a noted herpetologist and former wildlife researcher with the state Forest and Wildlife department. In 1975, the Union Ministry of Forest and Environment, in a collaboration with the United Nations Development Programme, had started a crocodile breeding and rearing project in Dangamala within Bhitarkanika. Forest officials counted 1,742 saltwater crocodiles in the water bodies of the park in January this year during the annual reptile census, added Kar.